← What Time Do The Polls Close? 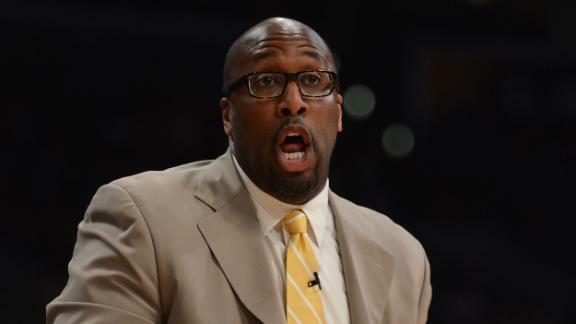 Mike Brown Fired As Lakers Head Coach! The Los Angeles Lakers have reportedly fired head coach Mike Brown in the wake of a 1-4 start. According to the Los Angeles Times, Brown was informed of the decision on Friday morning before the team was set to take on Golden State to start a six- game homestand. The Lakers lost their first three games before their lone victory — a 108-79 triumph over winless Detroit on Sunday. After a 95-86 setback at Utah on Wednesday, speculation surrounding Brown’s job status was rampant. Brown was just beginning his second year as Lakers coach. The team was 41-25 during the lockout-shortened 2011-12 season and lost to Oklahoma City in the second round of the Western Conference playoffs. Peace out MB….BRING BACK PHIL JACKSON! This entry was posted in Athletes, Sports and tagged Bad Coach, Lakers Fire Mike Brown, Lakers Head Coach, Los Angeles, Mike Brown Fired, NBA Coaches, Phil Jackson. Bookmark the permalink.